The boundary between the parish areas of All Saints and St Andrew the Less is the northernmost boundary in the cemetery. This boundary runs from the west wall and western path to the northerly extension of the central path. It is one of the shortest boundary lines in the cemetery, because the line of the west wall narrows sharply within the All Saints section. It runs between the parish areas of All Saints and St Andrew the Less. At the western end of this boundary line the stone is embedded in the west wall [illustration 1: ‘A. 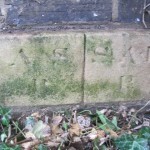 S. P. | St. A. L. P.’], and at the eastern end, at the edge of the central path, it stands in a crowded position close to two headstones [illustration 2: inscription illegible].